Lightweight - only 16 lbs. - and strong, designed to handle almost any domestic pet up to 300 lbs. in weight. 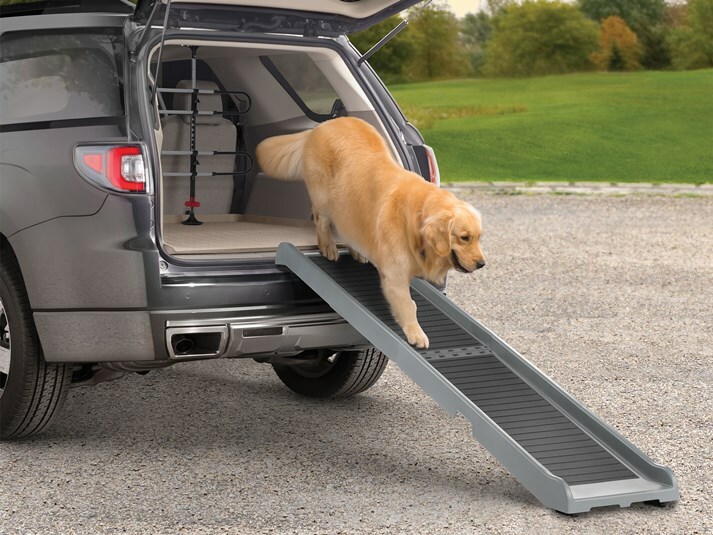 At only 16 lbs, the WeatherTech PetRamp is way lighter than the inferior imported ramps from overseas. So lifting it in and out of your vehicle is easier than any other ramp on the market. Pet Ramp measures 67 inches long unfolded and 15 inches wide, and folds to a compact 33.5 inches long. Pet Ramp weighs only 16 lbs. and supports up to 300 lbs. The PetRamp features a lightweight design (16 lbs) and can easily be folded and transported inside of any vehicle. The PetRamp measures 67" unfolded, 33.5" folded and 15" wide.